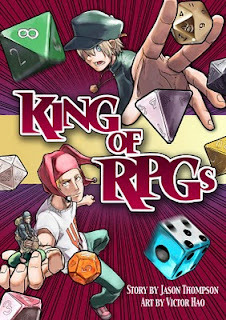 I have recently been frequenting the King of RPGs blog -- a blog used to promote gaming and the new King of RPGs Manga by Jason Thompson and Victor Hao. For the past few weeks, I've been deliberating whether or not to purchase the manga. After finally taking the time to view their Street Master video, I decided to take the plunge and order the book on Amazon today. Before I get into the premise of the manga, I thought I would share the premise of the Street Master, share the first Street Master video, and tell you why this strange occurrence tipped the scales and goaded me into purchasing King of RPGs. The Street Master is a mysterious individual who wanders Modern Post-Apocalyptic America in the pursuit of sharing the glory of role playing games with the world. Only role playing games can save us from the cultural (and entertainment) malaise currently overwhelming society. The Street Master sets up D&D games on street corners in random cities and evangelizes the entertainment merits of role playing games by recruiting passers by into spontaneous sessions of gaming fun. I think that this is an ingenious way to share our hobby with the world at large and wish more people would set up random role playing game sessions with the sole desire of sharing a fun time with complete strangers and spreading the word about this wonderful entertainment medium. I don't necessarily recommend spreading the word by dressing up in Necromantic Sorcerer garb like the Street Master, that doesn't really help dismiss stereotypes, though it might be interesting if there were suddenly multiple Street Masters running games in multiple cities at the same time. Regardless of the outfit, the gaming hobby desperately needs more advocates like the Street Master. There are a couple of things that happen in this video that prompted me to buy the King of RPGs manga. First, it's pretty obvious that the Street Master is Theo Dudek (the main character of King of RPGs) in disguise. Those nasty rumors that the Street Master is Jason Thompson obviously ignore the fact that Jason has horribly slandered Theo Dudek in print, and that his wearing of a d20 necklace would constitute mockery of the highest degree. Second, if the comic book exhibits anywhere close to the sense of humor it would take to initiate an endeavor like the Street Master, it will be an entertaining diversion. Third, the Street Master uses Gaming Paper in the promotion of our hobby. The folks at gaming paper are also wonderful advocates for the gaming hobby, and anyone who supports them deserves a second look. Fourth, the Street Master says something that I am quickly going to turn into my gaming mantra -- even though it is humorously ironic. "There are no limits in role playing games! ...Except the Rules!" I want to add that there has been a minor kerfuffle regarding King of RPGs and viral marketing in the RPG Bloggers Network. I'll write a post with my opinions on that soon. What do you think are the best ways to evangelize our hobby and expand the number of gamers playing role playing games?